Property Size 1,286 sq. ft. This is an ideal home for a quality family holiday, based in the well established, awarded and secure Terra Verde Resort. It`s just 15 minutes from Disney. The private patio is perfect to enjoy with the family! 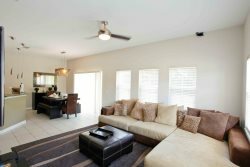 Strategically located near the famous Orlando theme parks and other special attractions, Terra Verde Resort is a Gated community with an incredible array of features to offer to your whole family, with beautiful Lakes, community Pool (heated), the arcade, sports courts, lakeside hammocks, pool side Tiki bar, fish stocked lake and much more. We really enjoyed the location, being in a gated community, loved the pool area, spend almost every day in the pool and hot tub. My husband and son-in-law used your gym daily as well. Would stay again. They were very friendly ! We felt well and we think that we come back next year ! !